PREMIER WEDDING CARS Premier Wedding Cars are an Eastbourne based company and are specialists in wedding car hire throughout East and west Sussex Surrey and Kent. All our vehicles are chauffeur driven, and are trimmed with matching bonnet ribbons and door bows. Our fleet consists of matching Ivory 1930's Vintage style Beauford's 2 and 4 doors are available. 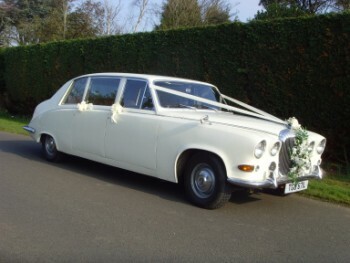 We also have a Brenchley Landaulette or a selection of seven seater Daimler Limousines. They are ideal as a Bridal car or for transporting the Groom, Best Man, Ushers, Bridesmaids, and the Bride or Grooms parents. If you favour a quirky way to arrive "Molly" our Ivory Morris Minor Cabriolet with matching cream leather interior is possibly the answer for you. For a modern way try our Silver Mercedes saloons. Premier Wedding Cars Please check our website for our "Special offers" Page.